Shah Rukh Khan brought in his birthday at his Alibaug property while fans of the superstar, unaware of his plans, reached his Mumbai bungalow Mannat to celebrate his birthday late night on November 1. Fans of the Fan star assembled outside the gates of Mannat with huge posters of the superstar and of course, a cake. 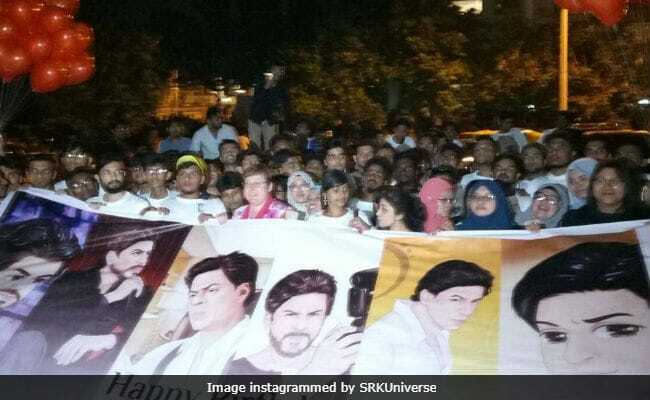 Fans clubs shared pictures of the scene outside Mannat from last night, hours before SRK's birthday. Amidst all the hustle-bustle, fans reported that some people stole their phones. As bizarre as it sounds, 12 FIRs were registered for stolen phones. Too bad. Here's a glimpse of how fans celebrated Shah Rukh's birthday outside Mannat in Mumbai. Celebrities arrived in Alibaug a day before Shah Rukh Khan's birthday. Some like Shweta Bachchan, Maheep Kapoor and daughter Shanaya, Bhavana Pandey and her daughter Ananya and Sussanne Khan travelled via a jetty with Gauri Khan and Suhana. Some celebs like Alia Bhatt, Deepika Padukone, Sidharth Malhotra, Karan Johar, Farah Khan and of course, Shah Rukh Khan (with AbRam) were choppered into the venue. The birthday celebrations started in the evening and Karan Johar (our favourite celeb at SRK's bash) shared many pictures from the party. Maheep and Sanjay Kapoor's daughter Shanaya shares her birthday with SRK and she was also a highlight for the evening. Love you farah!!!!! Watch out for the most talented photo bombers! The party is now over and celebs are now exiting Alibaug to get going with their work. Alia Bhatt, who is busy prepping for Gully Boy and Brahmastra, was photographed with Deepika Padukone, who will resume Padmavati promotion duty, leaving from Alibaug. All in all a grand birthday for Shah Rukh Khan but not for his jabra fans!